Approve the idea of a bloodmobile blood drive with your organization. Secure the bloodmobile date with Community Blood Bank by contacting us. 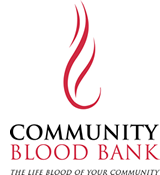 Receive information from Community Blood Bank. organization of the blood drive. Determine who will be at the organization the day of the blood drive. is open to the community). Take the registration information to meetings, gatherings, etc. Determine where the bloodmobile will park the day of the event (bloodmobile will take up approximately 6-8 parking spaces). High school blood drives; make sure you have talked with the nurses office regarding the blood drive, in case they have a few donors coming in after donation concerns. Take the registration information to other departments and gatherings and ask them personally to sign up. Email staff to ask them to sign up. Call or email people who have signed up and remind them of what time they are signed up for. The Bloodmobile usually arrives at the organization 45-60 minutes before the scheduled event - the staff will need a small table close to an electric outlet within the building to register donors. Have Department Leaders or Organizations Leaders announce that you will be taking walk-ins thorough email. Have the Leader donate first. Email throughout the day about the blood drive as a reminder telling people "we need more people to donate, no waiting" etc. Fill in early morning slots on the registration form first. Having a team work on this can be helpful. Keep an open mind when asking people to give. Just because someone was rejected in the past, they might be able to give now.